I decorated the cover of my composition book! I wanted a simple design so that I would not feel intimidated to use my art journal. I used sandpaper on the cover to get some of the glossy finish off. I used Original Tacky Glue and attached three layers of yellow tissue paper. 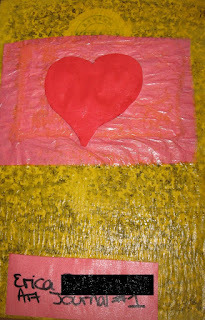 I attached a piece of pink construction paper and then a red heart made of construction paper. I also attached another piece of pink paper with my name and "Art Journal #1" on it. Lastly, I covered it with a gel medium. I wish I would have used gesso after I used the sandpaper, so that the writing on the cover would be covered. I may add a few extra layers of yellow tissue paper.